The last three images are from Suzanne Stryk’s series Notes on the State of Virginia. 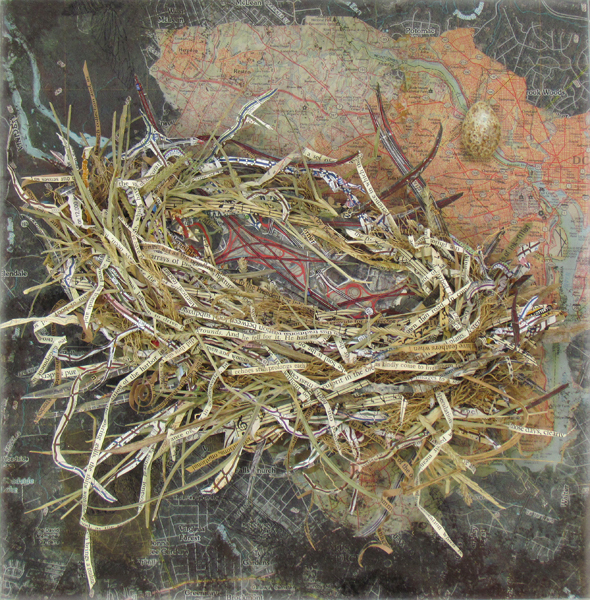 Bridge (Ridge and Valley) comprises acrylic on paper (bird), a United States Geographical Service topographical map, a swallow genome printout, and rock dust on frosted Mylar (over map). 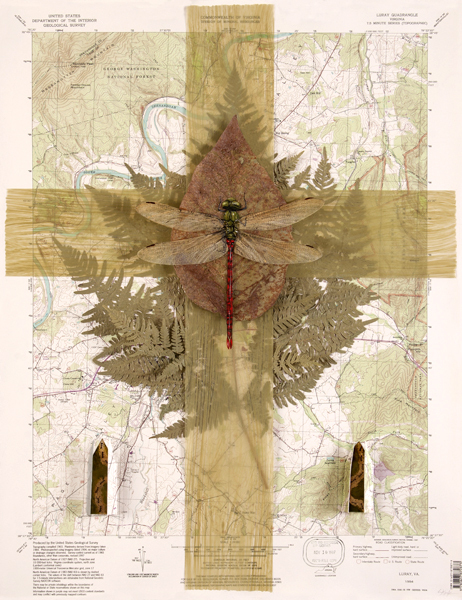 Sacrament (Blue Ridge) comprises acrylic on Mylar and paper, a USGS topographical map, and ferns and leaf. Urban Nest (Northern Virginia |Washington Metropolitan Area) is composed of acrylic, road maps and other printed paper, grasses, a map, and a mirror. A video about Suzanne Stryk’s series Notes on the State of Virginia, which currently is traveling through the state, may be viewed on YouTube. On the prow of my kayak, a dragonfly twists its head robotically before darting into a swarm of midges gyrating over the water. I try to imagine being that hawk of an insect—fast flight, multi-faceted vision. I do to some degree. But what I really know is my own point of view. 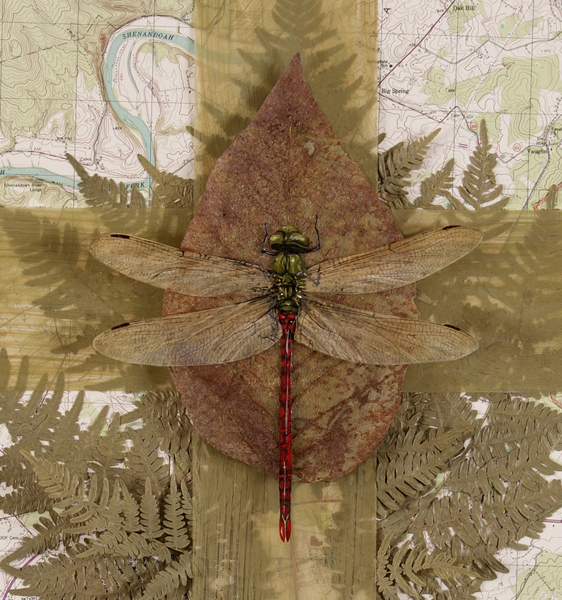 I give the dragonfly a name, “Comet Darner”; what’s more, in my mind, it becomes an icon of the entire ecosystem as I float there on the revered Shenandoah River. I imagine tiny coils of the insect’s DNA—life’s unseen instruction manual found in every cell, mine included. 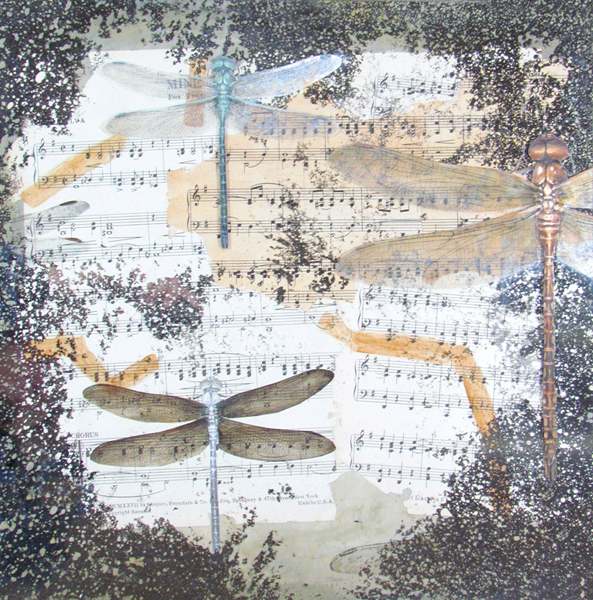 And I imagine mixing lacquer red and olive green to capture this dragonfly in paint. Such are the layers of experience and thought I combine in art. 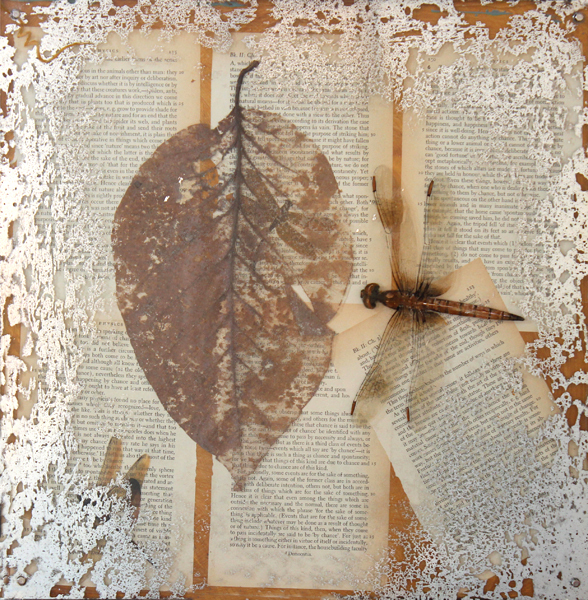 In my mixed-media pieces, I literally layer painted images of insects and birds (or their feathers, eggs, and nests) with pressed plants and old book pages or sheet music. A mingling of nature and culture. All of these I assemble on a topographical map or tarnished mirror. I love these maps for their intricately undulating lines, lines that suggest how much we know about the land, and how much we don’t. And I love tarnished mirror, silver peeling off the back in places, so our reflections merge with an insect or feather painted on, or under, its gleaming surface. 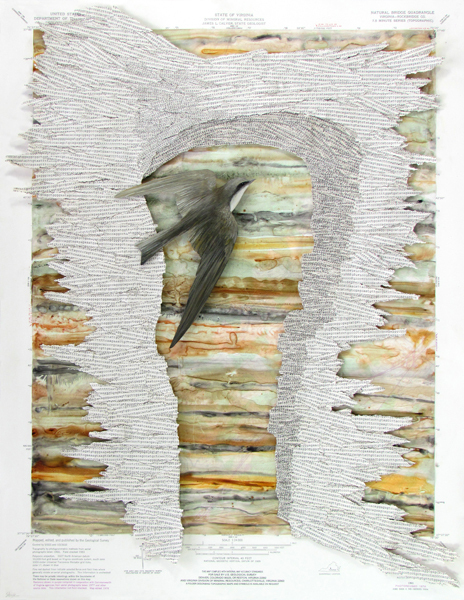 Born in Chicago, Illinois, Suzanne Stryk currently lives in southwest Virginia. 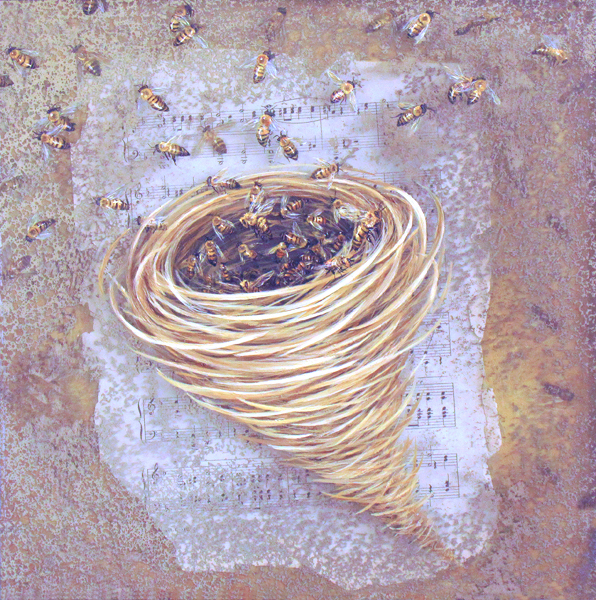 She has shown her conceptual nature paintings in solo exhibits through the United States, including the Morris Museum of Art (Augusta, Georgia), the United States Botanic Garden (Washington, D.C.), The Eleanor B. Wilson Museum (Virginia), and Gallery 180: The Illinois Institute of Art (Chicago). In 2005, a mid-career survey of the artist’s work, “Second Nature: The Art of Suzanne Stryk”, was organized by the William King Museum (Abingdon, Virginia), an affiliate of the Virginia Museum of Fine Arts. Most recently, the solo exhibition “Suzanne Stryk: Notes on the State of Virginia” appeared at The Athenaeum, Alexandria, Virginia, from December 15, 2015, through January 31, 2016. It travels to the Museum of the Shenandoah Valley, Winchester, Virginia, where it may be seen from May through September 2016. 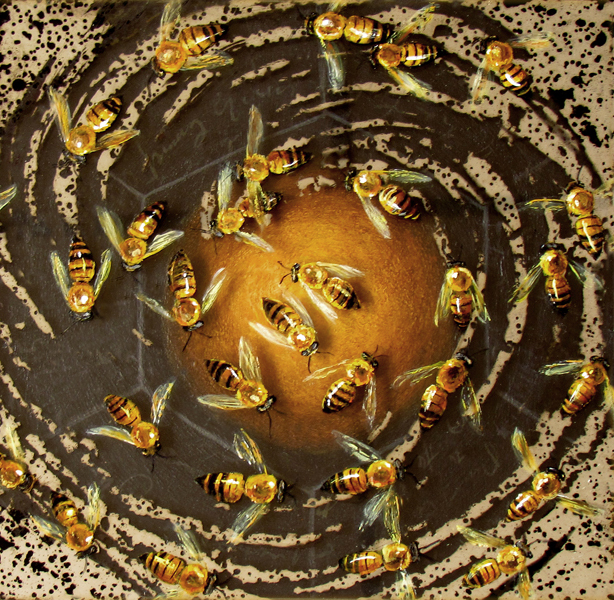 Suzanne Stryk’s images have appeared in numerous publications, with full portfolios in Shenandoah, Ecotone, Antennae: The Journal of Animals and Visual Cultures, and Orion. The artist and her husband, writer and poet Dan Stryk, create collaborative poetry-and-painting videos that appear on their blog Red Eft Editions. 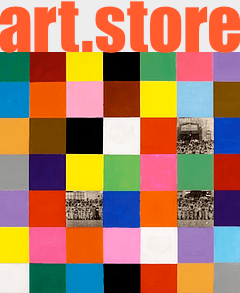 Some collections in the United States and abroad that include Suzanne Stryk’s paintings are the Smithsonian (Washington, D.C.), The David Brower Center (Berkeley, California), The National Academy of Sciences (Washington, D.C.), Taubman Museum of Art (Roanoke, Virginia), and the D’Arcy Wentworth Thompson Art Collection (Dundee, Scotland). Suzanne Stryk’s series of drawings Genomes and Daily Observations appears in the Viewing Program at The Drawing Center (New York City). 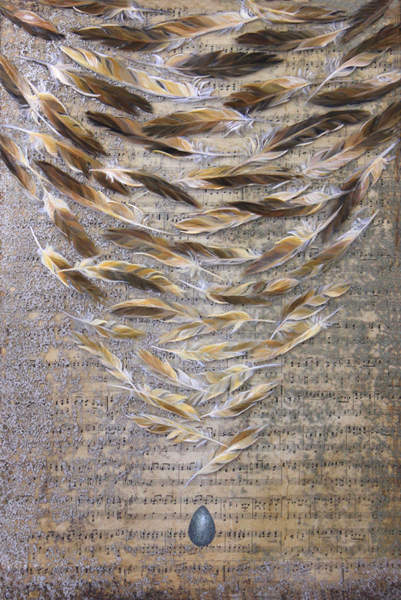 The recipient of a fellowship from the Virginia Commission for the Arts (2011), for Notes on the State of Virginia, and of a grant from the George Sugarman Foundation (2007), Suzanne Stryk is represented by Blue Spiral 1, Asheville, North Carolina; and Cumberland Gallery, Nashville, Tennessee.